A recent undercover investigation by the Humane Society of the United States has yet again exposed abuses at Petland. The national chain of pet stores — which still sells bunnies, kittens and puppies — has been linked to puppy mills through past investigations. Our latest look into one of the United States' largest pet store chains has now linked them to a rabbit mill and uncovered massive indifference to rabbits in a Virginia location. Our investigation found that rabbits in the store were deprived of veterinary care and often died. The undercover investigator found 14 dead rabbits in Petland's freezer on a single day in January 2019 alone. 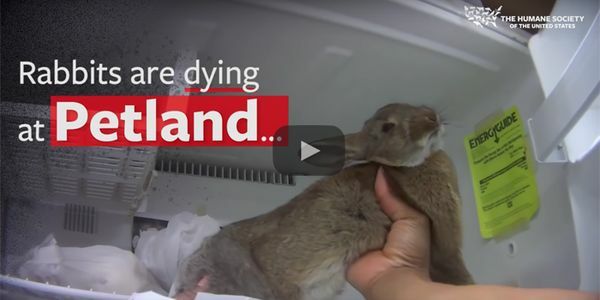 Petland and its employees seemed to show little concern about the health and well-being of rabbits, and when the rabbits died, there seemed to be no attempt to find out why. One employee stated on hidden camera, "There's nothing we can do because they don't get checked by a vet. We just let them die." The more public pressure placed on Petland, and the more signatures we collect, the more likely Petland is to change. We're urging Petland to go humane by not selling bunnies, kittens and puppies. Please sign the petition and demand that Petland changes their model and stops empowering puppy and other animal mills. A recent undercover investigation by the Humane Society of the United States has unveiled terrible abuses in Petland stores. The investigation revealed that rabbits in the store were left unsupervised with children, some of whom ended up dropping them, and that sick rabbits received little or no veterinary care that we could find. The store personnel showed little concern for these sensitive animals who are prone to injury and heart attacks. An undercover employee was told that the store gets most of its rabbits from a local breeder. An undercover investigator visited the property, Wagner Farms in Maryland, in March 2019, and documented about 200 rabbits housed in crowded and dirty conditions. At least one rabbit at the breeder's facility was dead and others appeared to be injured. The facility was clearly a "rabbit mill," similar to the inhumane puppy mills that Petland has been linked to in our prior reports. It's time to go humane. It is possible to thrive as a business without selling bunnies, kittens and puppies. Make money from the billions of consumer dollars spent on products and services, rather than baby animals raised in mills.